PRODUCT DETAILS Laurence Tavernier: Idylle Collection – Look your best with the refined, classic styles of Laurence Tavernier. Elegant designs boast of French sophistication and subtle feminine details. Enjoy everyday luxury with this timeless collection. • Laurence Tavernier: Idylle Pajama • Cotton long sleeve pajama with subtle yet stylish detailing. • Button-up V-neckline with mother of pearl buttons. 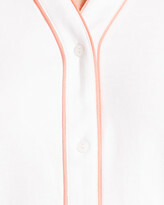 • Charming contrasting piping along neckline, button placket, and sleeves. • Gently tapered pant with elastic waistband. • US Dress Sizing: S=2-4, M=6-8, L=10-12. • 100% cotton. Collection Details Learn More About Laurence Tavernier Self-taught, creative and entrepreneurial, Laurence Tavernier is a true French woman who is proud of her Lyons origins. She began working at a young age, and soon realized that the traditional style of home and loungewear was changing. In 1987, she created her own label out of a desire for beautiful clothing that would also be comfortable to wear. Her sense of tradition, passion for discovery and love of travel, combined with her savoir-faire and open mind formed the foundation of her business. With a beginning rich in tradition, Laurence Tavernier collections have developed a style recognized worldwide as timeless elegance. Founded in the tradition of couture, Laurence Tavernier's designs showcase refined details, elegant fabrics and artistic talent. Each collection reflects her personality and lifestyle, that of discretion and elegance, while continually anticipating the changes in modern life. Her styles are always simple and practical, yet modern and elegant. Laurence Tavernier's understanding and perception of the art of living is translated into the shapes and cuts of her luxurious robes, pajamas and nightgowns. She adds her finishing touches to these innovative and daring garments in the final stages of design and production, in order to create modern, unique pieces. Laurence Tavernier has created a versatile style for the home, which easily translates from day to night. These sophisticated styles adapt to all occasions, while maintaining Tavernier's principles of comfort, elegance and refinement. Choose the Laurence Tavernier style, where comfort and glamour remain inseparable.